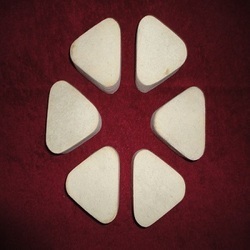 Our product range includes a wide range of felt polishing triangle. By keeping track of the latest market development, we are engaged in manufacturing, exporting and supplying Felt Polishing Triangle. The offered felt triangles are manufactured using fine quality material and advanced techniques. Our felt triangles are checked by our quality experts in order to assure its flawlessness from our end. We provide these felt triangles from us at reasonable rates from us.